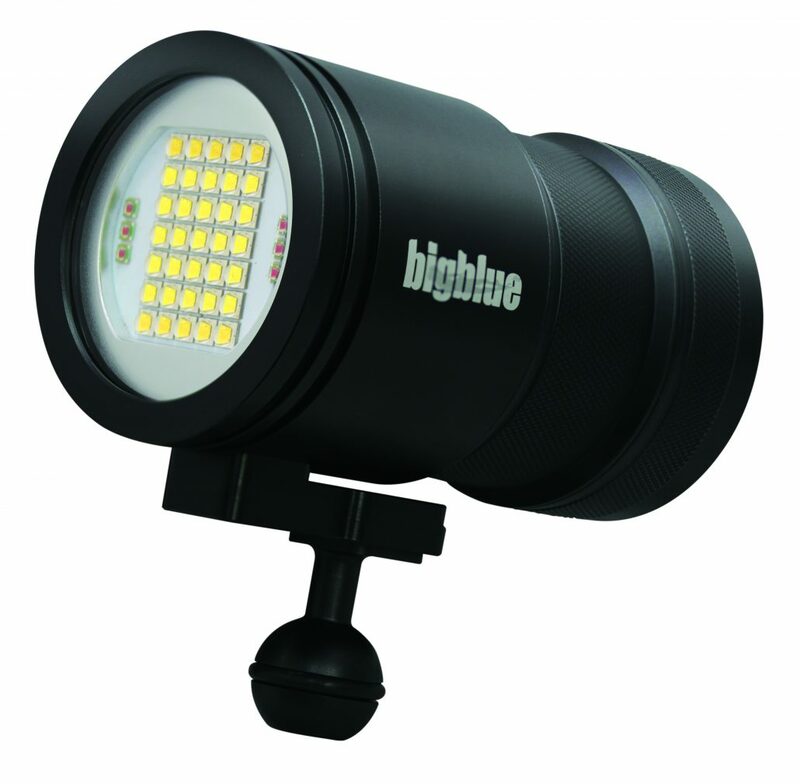 Big Blue’s 15000P Pro Tri-Color Lights… The Best “Bang For Buck” U/W Video Lights On The Market Today? 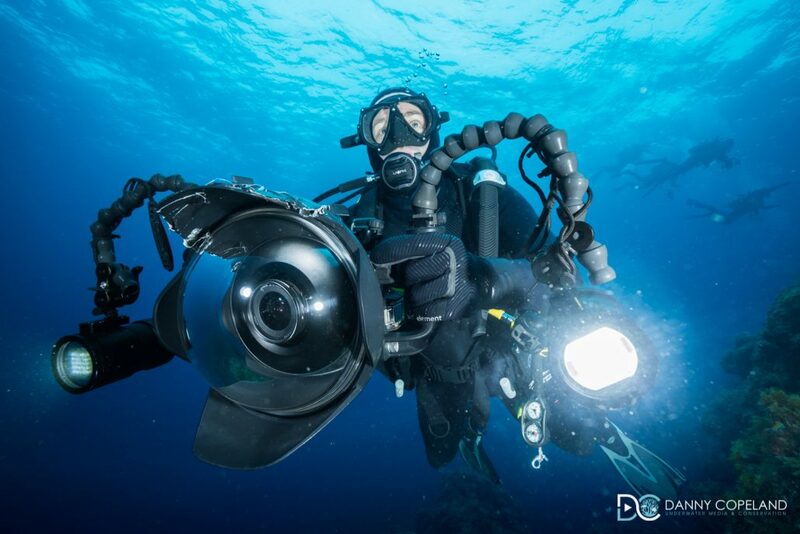 On our recent shoot in The Azores, helping with production and shooting a Behind The Scenes film about the 360VR project, “The Mini-Mantas Of Maria,” I was lucky enough to have a pair of Big Blue’s professional 15000P Tri-Color video lights to use in my month on the island. This came about after I was turned on to Big Blue by Dean Martin from UK dive manufacturer, Apeks, who had raved about them to me a couple of months earlier. Dean put me in contact with Alastair Ansell at Liquid Sports so I could find out more and fortuitously, when the shoot came about, Alastair gave me the chance to take a pair on location with me to try out. I have been looking to upgrade my underwater set up for sometime, including lighting and having used a pair of Sola 1200’s for the last few years, I was due an upgrade. 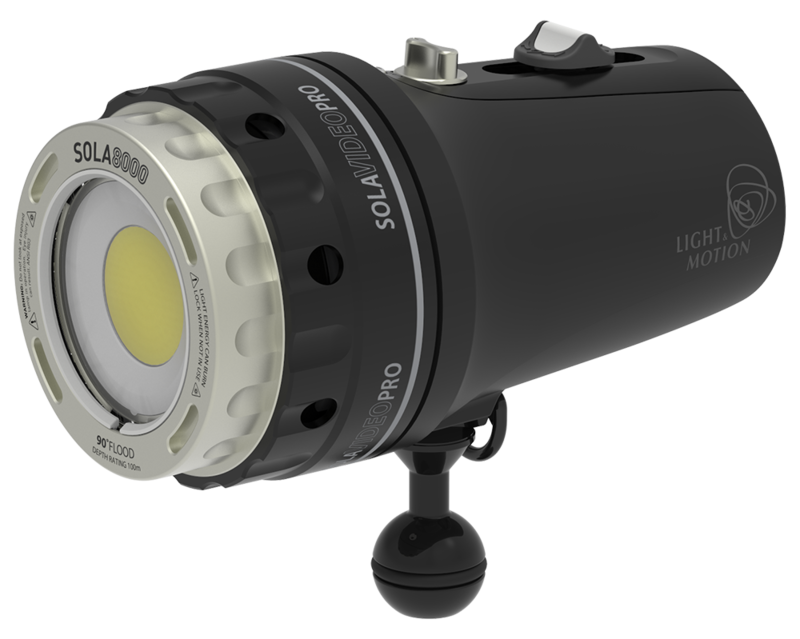 Don’t get me wrong, the Solas are good lights but they are not professional quality and I needed not only more power but also a better spread as I tend to shoot underwater predominantly between 10-18mm on a Canon 7D (at 1.6x crop) and I need that frame filled with light and no visible ring in the image. 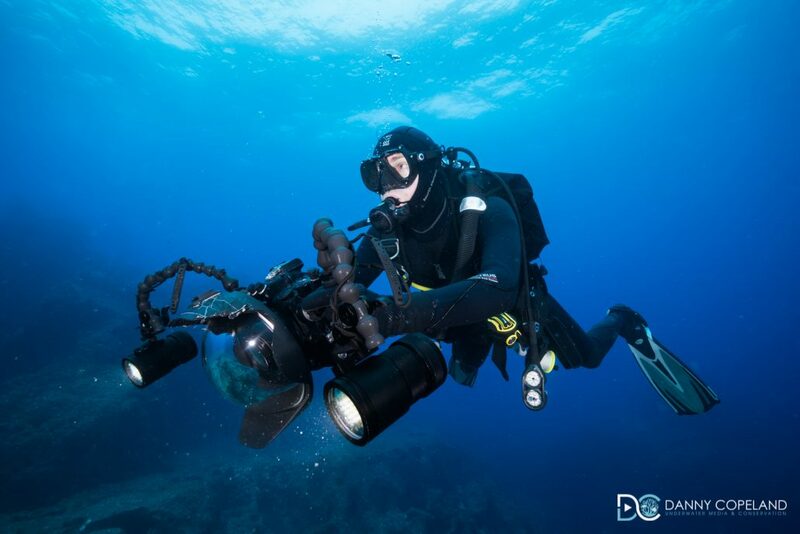 When Dean pointed me towards Big Blue, I knew very little about them and was instantly impressed with the specs so now would be a good time to list the key details that influence you, the consumer, when looking to buy a set of underwater video lights. Now, let’s look at a few of those specs in more detail, there are a few which immediately stood out to me upon first viewing. Firstly, the power, it’s quite a step up to go from 1200 lumens to 15000! I like to run my lights at full power where possible, even in broad daylight, this is primarily for focussing reasons. If I have plenty of light, I can stop down the camera to anywhere from f7.1 to f22 meaning getting critical focus on moving subjects becomes a more straightforward process, particularly on those small DSLR screens. Having plenty of light also means lower ISO, I don’t like to go above 640 if I can avoid it due to issues with digital noise. I have in the past had to blast the ISO up to 1600 which means a ton of work in post to clean up that footage and it never comes out as clean as you would like. In the Azores, using these lights I never went above 320 and even then, those “higher” ISO shots were at depths greater than 30 metres. When running lights at full power that, of course, affects battery life. On my previous set up, at maximum power, I was getting about 35 minutes at full power before having to recharge which would take approximately 2-3 hours for a full charge. With the Big Blue 15000P’s I get 3 hours at full power which is phenomenal. I never once needed a recharge between dives and the lights never went below 50% charge and even when they went down to around half the battery life, quality and power of the light did not diminish. At the end of each day I would recharge from between 50-70% and it would take approximately 1-2 hours to charge. This is a big battery and a full charge will take around 4 hours which is still not bad at all. Simply charge overnight and you’ll be set for the day ahead. The other spec which jumped out at me as a potential game changer for me is the width of the light beam. 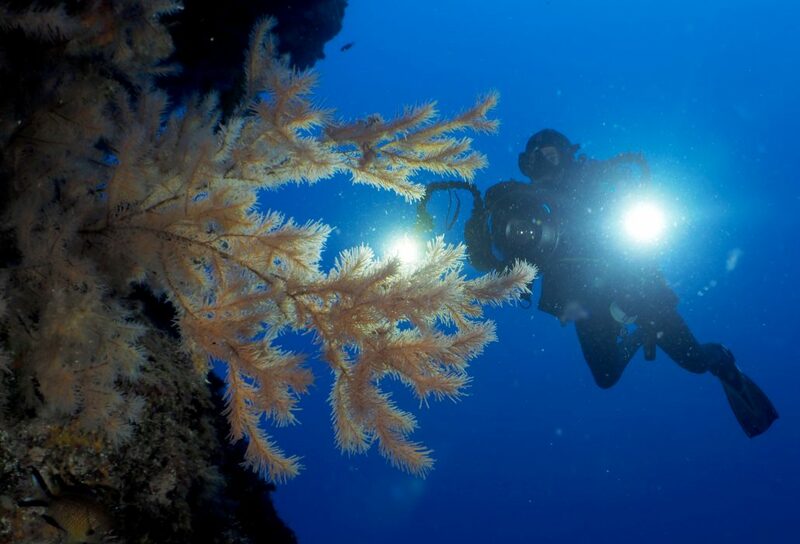 160 degrees is pretty incredible, I’ve been used to 60 degrees which, with the lens at full width, would mean I could never light the whole frame and in low light and night dive scenarios, this is a real problem. Shooting at 10mm on a 1.6x crop sensor, I was able to light the whole frame, corner to corner with no vignette and the difference to the footage is quite remarkable. It also means that underexposing parts of your shot (meaning ugly, digital noise) is now less of a problem and all that means the one thing most important to a Cinematographer… Better footage! Regarding the quality of light itself, it is beautiful. I was shooting on the cool white setting at 6500K, the beam is nicely diffused, brilliantly even in the spread and brings out natural colour and skin tones wonderfully. This was a real revelation for me, gone was the warm tint I have experienced from other lights, instead, I was able to light a shot to capture vivid natural colours. 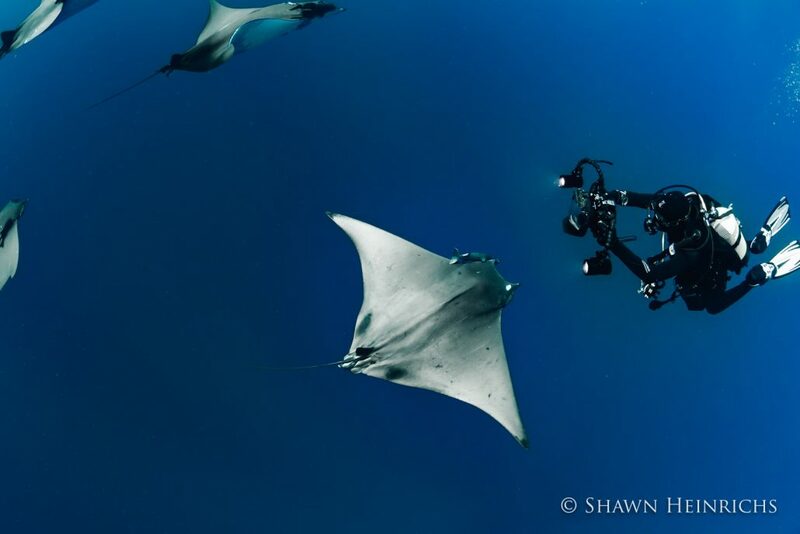 Watch the video and see the undersides of the Mobula Ray’s wings, they are not blue, they don’t have that red tint, they are white, exactly as they are meant to be and this makes grading underwater footage a much more pleasant experience. What was also noticeable was reds underwater were much softer, displaying none of the harsh, deep red, warmer lights can create which is a nightmare to grade out. When I was looking at a new set of video lights I was looking at three main factors, power, burn time and width of beam and as you can see, the Big Blue 15000P outperforms both these industry leaders in every aspect, almost double the light output, considerably better burn time at full power and 70 degrees more light beam coverage. 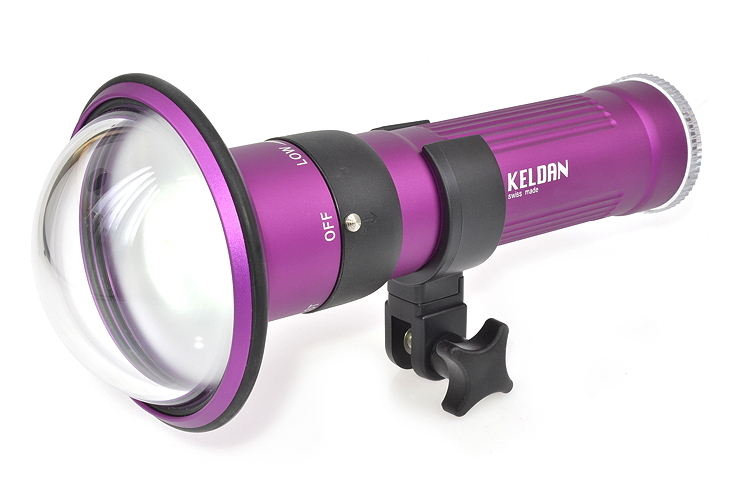 Both Keldan and Light & Motion make excellent lights and these two models are their pro-standard products but on these specs alone, Big Blue have beaten them hands down. The other main factor we have to look at is the price, the Solas coming in around the £1500 mark each, the Keldans at around £1300 and remarkably, the Big Blues at £999. That’s still not cheap but these lights are professional standard, outperforming their main competitors in the market and still coming in £300-500 cheaper each than the aforementioned competitors. Before I move on to the conclusion of this review I will point out something you may have noticed from the picture above. That is NOT how to attach the lights to your housing! Given these lights arrived the day before I was due to fly to the Azores, when finding out they didn’t fit my existing locline arms, I had to rig something so I could use them in the field. If you choose not just these lights but any new lights, make sure you have the correct mounting solution, you don’t want them to disappear into the blue during a shoot! I LOVE these lights! Every issue I have previously encountered with lighting underwater video was fixed by the Big Blue 15000P underwater video lights. The quality of light, the power, spread and phenomenal battery life all had a marked effect on the quality of footage I was able to capture and made shooting images underwater in challenging conditions a pleasure from start to finish. Alongside the obvious plus points against their competition, including price, they are a good size, actually smaller than I thought they would be and they are incredibly robust so in terms of a box ticking exercise, they comfortably fulfilled everything I was hoping for, over delivering on my expectations in every respect. Would I recommend them? Absolutely! Whether you’re a pro or an amateur with the budget to invest in a pair of high end lights, the Big Blue 15000P lights should be on your list to check out for sure. If you asked me “which video lights should I buy?” the answer will of course depend on your budget and what you want from a set of lights but if they’re in your price range, these lights would absolutely be my number one recommendation. I was provided with these lights by Alastair Ansell at Liquid Sports for a field test and review, I was not paid any money to review the lights and from the outset made it clear my review would be completely impartial and honest. I now own these lights based entirely upon the quality of the product itself. My expectations from the gear I use are extremely high, as a sponsored professional with Apeks, Fourth Element and Novatech, I feel it is my responsibility to give a genuine representation of my own experience with certain products and if required, offer feedback and suggestions for improvements if necessary. If you have any questions about the review or the lights themselves, please leave a comment on the video review and I will answer honestly and as soon as possible. Of Shark and Man At Berlin International Filmmaker Festival Of Shark and Man Dubai Screening!